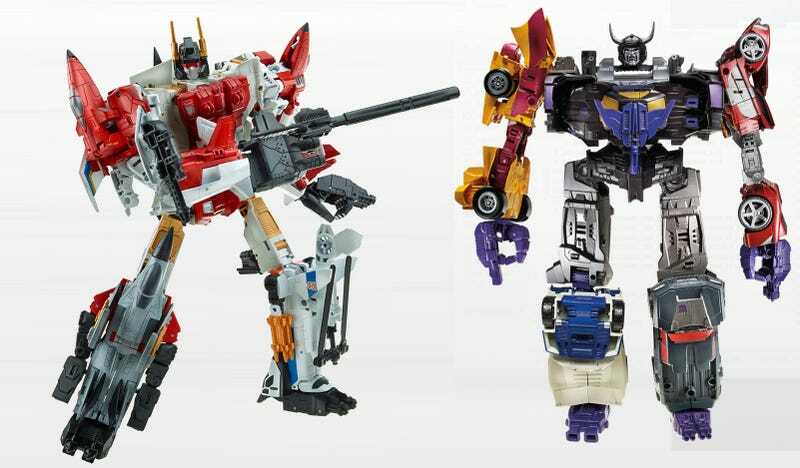 While the kid-focused Transformers toys of 2015 will revolve around the upcoming animated series, the adult collector catering Generations line is going combiner crazy, with new takes on the massive amalgams of Aerialbots and Stunticons — Superion and Menasor. The first two of what I hope to be a full line of revitalized gestalt sets, Superion and Menasor were the original rival combiner teams. The Constructicons and Devastator came first, but instead of facing off against a similarly functioning enemy team, their arch enemy was Omega Supreme, a regular Omega with sour cream and tomatoes. Superion and Menasor arrived together, a matched set. The Decepticons flew and the Autobots drove, so these two sets were meant to fill gaping holes in each army's lines. Superion is formed from five planes. The Voyager-class Silverbolt (famous from the original cartoon for being afraid of heights) forms Superion's torso. While three planes — Skydive, Airraid and Firely — and one helicopter (Alpha Bravo who?) form the Deluxe-class limbs. When they come together, they form the mighty Superion. Meanwhile, in evil land, Menasor begins with Voyager-class Motormaster, who seems a lot more compact than I remember. And the limbs are deluxe Offroad, Dragstrip, Dead End and Breakdown. Alone they are powerful, but together — they're pretty unstable. I'm loving the look of the new combined forms. I'm just hoping they aren't quite as flat as they were back in the old days. Give me a beefy combiner, like Magnaboss from Beast Wars. Or just give me all of the combiners, re-engineered to today's standards. Brutacus (yes, again), Defensor, Computron, Abominus — bring the whole thing together with a retooled Predaking (we can never have too many). 2015 is going to be an excellent year for Transformers. Between the Combiner Wars! and the Robots In Disguise cartoon toys (loving the new Bumblebee), Hasbro is going to have all of my money forever.